Reference number for this case: 23-oct-54-Wittenheim. Thank you for including this reference number in any correspondence with me regarding this case. On October 22, 1954, the Press reported that many witnesses had seen impressive maneuvers of a flying object above Wittenheim in the Haut-Rhin. You can find information on this observation in its own file. One of the witnesses of the sighting, policeman Muller of Wittenheim, later found in a garden, or his garden, a forked radish that had the looks of a "Martian". However, the Parisian weekly tabloid Radar for November 7, 1954, thought it was clever to tell about it as if policeman Muller was serious, as if the radish was a real Martian. In the 1970s, the case entered as a summary in the "UFOCAT" catalog in the USA. Then in 1979, debunkers Barthel and Brucker told of the case as an "example", explaining that during the 1954 French saucer flap, "people invented Martians of the most extravagant shapes" such as the "vegetable Martian" of Wittenheim. The same year, ufologists Figuet and Ruchon explained that it had only been an innocent joke, the "Martian" was never taken for anything else than what it was, a radish with a weird shape. This did not prevented others thereafter in France and elsewhere, to write such nonsense as "Mssrs Muller, Meyer, and Settner [sic] and Mrs. Zimmerman saw a little creature that looked like a radish." And it continued like this though I narrated the case on my website in 2008. "... I saw it in my garden! You can believe me, swears the police officer M., the Martian who was prowling in my garden of Wittenheim was like this black radish)." 1954 - That same night a big, bifurcated black "radish"-shaped creature was seen walking around Wittenheim, France. (Source: Paris Radar, October 31, 1954). The authors indicate that in 1954 people invented Martians with the most extravagant forms, like the "vegetable Martian", a small being in the horseradish shape observed in Wittenheim in the Haut-Rhin at the beginning of November 1954. "Agro-ufology" starts here! He is not green, he is black. He is not a small man, he is a large radish. See the photographic document "Radar" in "La grande peur Martienne." The policeman Muller claims "The Martian who prowled in my garden resembled this radish." (Ref. : Radar magazine # 300 for 11/07/54). According to Barthel (p. 85), it was a joke between friends. The case of Wittenheim (68), in November 1954, would boil down to a bar joke and not to a famous RR3 hoax quoted by B & B. We agree with J. Sider, while pointing out that the press was eager to amplify all the information on the subject during this great wave. The weekly magazine Radar published on November 7, 1954, this information: polie officer Muller of Wittenheim (68) affirms "the Martian that prowled in my garden resembled this dwarf radish." Explanation: prank between friends or journalistic hoax? -J. Sider "Dossier 54..." pages 64,65 (1997). M Muller, a police officer, saw a "Martian" in his garden that resembled a big bifurcated black radish. There were three other witnesses. No other information. 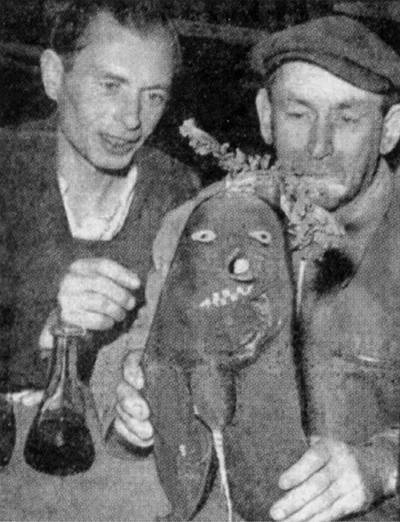 1954 - That same night a big, bifurcated "black radish" shaped creature was seen walking around Wittenheim, Haut-Rhin department, France. Mr. Muller, a policeman, saw the being in his garden. There were three other witnesses. (Sources: Paris Radar, October 31, 1954; David F. Webb & Ted Bloecher, HUMCAT: Catalogue of Humanoid Reports, case 1954-114). The website indicates that 23 October 1954 at 23:00 in Wittenheim, France, "Muller, a policeman, saw a being in his garden that resembled a big bifurcated "black raddish". three other witnesses." And: "That same night a big, bifurcated black "radish"-shaped creature was seen walking around Wittenheim, France ." And: "An unidentified object at close range and its occupants were observed by four witnesses (as reported to the police) in a garden for ten minutes (Muller). One radish-like being was seen." And: "M Muller, a police officer, saw a "Martian" in his garden that resembled a big bifurcated black radish. There were three other witnesses. No other information." The sources are noted as Webb, David, HUMCAT: Catalogue of Humanoid Reports; Vallee, Jacques, Computerized Catalog (N = 3073); Newspaper Clippings; Rosales, Albert, Humanoid Sighting Reports Database. Donald Johnson indicates that in 1954, among the UFO occupants reported, were nonhumanoid "radish" looking creatures. M Muller, a police officer, saw a “Martian” in his garden that resembled a big bifurcated black radish. There were three other witnesses. No other information. *Oct. 23, 1954 - That same night a big, bifurcated "black radish" shaped creature was seen walking around Wittenheim, Haut-Rhin department, France. Mr. Muller, a policeman, saw the being in his garden. There were three other witnesses. (Sources: Paris Radar, October 31, 1954; David F. Webb & Ted Bloecher, HUMCAT: Catalogue of Humanoid Reports, case 1954-114). Messes Muller, Meyer, Settner and Mrs Zimmerman saw a little being that resembled a black radish. Jacques Bonabot citing an undated 1954 edition of Radar. In this book, he writes about the observation in Wittenheim on October 22, 1954, with the testimony of the son of Jean-Marie Stattner, witness like his father. The son told 50 years later, on 23 February 2004, to Christian Valentin, that he remembers that a few days after the observation, the newspaper published a photo of a "Martian" carved in a beetroot. The object had been brought to the Zimmerman coffee shop where witnesses of observation had gathered on October 22, 1954. The son notes that the irony and skepticism had greatly affected her father, who had been deeply upset by the scoffing. Valentin adds that 25 years later, in their book "La Grande Peur Martienne" ("The Great Martian Scare"), Gerard Barthel and Jacques Brucker highlighted the Radar version indiscriminately. 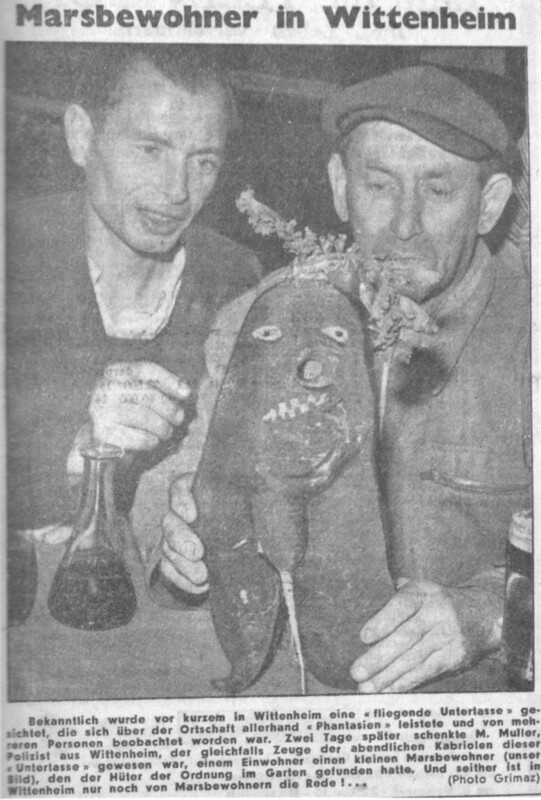 This photograph of the infamous radish was published in the regional newspaper Les Dernières Nouvelles d'Alsace on October 30, 1954, and then in Radar magazine. This not in any manner and never was an observation of a UFO or occupants, it was never presented as such neither by the "witnesses" nor by ufologists except for UFOCAT, a database started by the Condon committee in the US where the radish is claimed to have been walking! The "witnesses" were perfectly conscious of the reality: they found a radish with an unusual and funny shape and told about it. It was fun stuff, and certainly not intended to convince people that the radish really was an extraterrestrial. 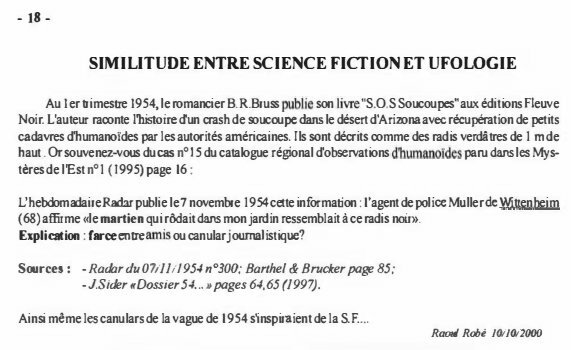 The story was used by the press to ridicule the flying saucer topic, and much later by French debunkers Gérard Barthel and Jacques Brucker to ridicule ufology. [dn1] Article in the regional newspaper Les Dernières Nouvelles d'Alsace, Mulhouse, France, October 30, 1954. [ra1] Article in Radar magazine, Paris, France, #300, November 7, 1954. [mf2] "Catalogue Francat des rencontres rapprochées en France (Listing 800 1982) (2 - Suite)", catalogue compiled by Michel Figuet, in the ufology magazine Lumières Dans La Nuit (LDLN), France, #257-258, page 20, November / December 1985. [mf1] "Catalogue Francat des rencontres rapprochées en France - Listing 800", "Explained CE3s", catalogue by Michel Figuet, in the ufology magazine Lumières Dans La Nuit (LDLN), France, #265-266, page 19, July / August 1986. [rr1] "Catalogue Régional des Observations d'Humanoïdes du Nord-Est de la France et du Luxembourg (1)", compiled by Raoul Robé, Alain Gamard, M.L. Blaise, M.D. Bleux, in the ufology magazine Lumières Dans la Nuit (LDLN), France, #267-238, page 38, September - October 1986. [---] Ufologist Jacques Bonabot, Belgium. [rr3] "Catalogue régional des apparitions d'humanoïdes dans le Nord Est - Réponse des 'débunkers de l'Est' à Jean Sider", article by Raoul Robé, written in January 1998, in the yearly ufology magazine Les Mystères de l'Est, CNEGU, France, #4, page 143, 1998. [rr2] "Similitudes entre science fiction et ufologie", article by Raoul Robé, in the ufology magazine Les Mystères de l'Est, CNEGU, France, #7, page 18, 2002. [cv2] "Mythes et Réalités des Phénomènes Aériens Non Identifiés - Histoire des soucoupes volantes en Alsace jusqu'en 1980", book by Christian Valentin, Grimoires d'Alsace publishers, France, page 51, 2012. 0.1 Patrick Gross April 30, 2008 First published. 1.1 Patrick Gross February 28, 2010 Additions [ud1], [dj2]. 1.2 Patrick Gross August 19, 2010 Addition [rr1]. 1.3 Patrick Gross August 15, 2013 Addition [pr1]. 1.4 Patrick Gross October 10, 2014 Addition [ta1]. 1.5 Patrick Gross October 23, 2014 Addition [ni1]. 1.6 Patrick Gross April 30, 2015 Additions [cv2], Summary. 1.7 Patrick Gross January 24, 2017 Addition [ub1]. 1.8 Patrick Gross December 8, 2018 Additions [mf2], [rr2], [rr3], [pr2].